Glenn Jordan and Chris Weedon look at the role of culture in reproducing and contesting social relations of class, gender and race. 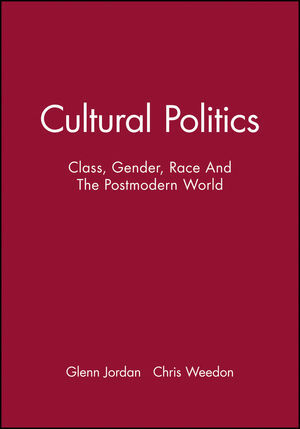 They focus on relationships between culture, subjectivity, and power, in what is the first comprehensive introduction to contemporary cultural politics. * Whose culture shall be the official one and whose shall be subordinated? * What cultures shall be regarded as worthy of display and which shall be hidden? * Whose history shall be remembered and whose forgotten? * What images of social life shall be projected and which shall be marginalized? * What voices shall be heard and which shall be silenced? * Who is representing whom and on what basis? * How can marginalized and oppressed people be empowered to change their social position? * What is cultural democracy and how can it be achieved? These key questions are among the radical issues Cultural Politics addresses, through case studies from Britain, North America, Eastern Europe and Australia. Glenn Jordan teaches cultural and media studies at the University of Glamorgan. He previously taught at the University of Illinois. He has published on cultural theory, racism and Black intellectual history. Chris Weedon teaches critical theory, cultural studies and women's studies at the University of Wales, Cardiff, and her books include Feminist Practice and Poststructuralist Theory (1987), published by Blackwell. Part I: Mapping the Terrain:. 1. Introduction: What are Cultural Politics?. 2. Liberals and Humanists, Cosmopolitans and Eurocentrics: on the Development of Cultural Policy in Britain. Part II: The Cultural Politics of Class:. 3. Writing as a Weapon in Class Struggle: Radical Cultural Politics in Britain to the Second World War. 4. Marxist Cultural Politics in Eastern Europe: the Case of the German Democratic Republic. 5. Whose History is it? Class, Cultural Democracy and Constructions of the Past. Part III: The Cultural Politics of Gender:. 6. Feminism and the Cultural Politics of Gender. 7. Alternative Subjectivities: White Feminist Fiction. 8. Gender, Racism and Identity: Black Feminist Fiction. Part IV: The Cultural Politics of Race:. 9. Marking Difference, Asserting Power: the Cultural Politics of Racism. 10. Primitives, Politics and the Avant-garde. 11. Dialogues: Race and the Cultural Politics of the Avant-garde. 12. Encounters: Postcolonial Artists and the Art Establishment. 13. From Primitivism to Ethnic Art: Neo-colonialism in the Metropolis. 14. Racism, Culture and Subjectivity: Australian Aboriginal Writing. 15. The Postmodernist Challenge/Challenging Postmodernism: a Cultural Politics for Today. Index of Names and Voices.